I will never forget the day that my son opened up his Golden Thomas. The look on his face was priceless. It was as if he had just discovered a train that no other person in the world had ever seen. He carried it with him everywhere!! The greatest thing about Golden Thomas is that it’s still the coolest of all the characters – Thomas himself – but a little extra special. I’m assuming by this point you already have a basic train track set, if not many, many extension sets. Hours upon hours can be spent making different train tracks and simply pushing along the trains. Once your little guy has mastered the flat, level surface of his track set nothing will excite him more than adding a bridge or two. And of course, you’ve got quite the selection for which bridges to add. There are ones with arches, one with an actual tunnel, and some that are still flat, but look just like a bridge. All of a sudden that amazing track you’ve been building has just become ten times more exciting! If you’ve watched Thomas 5000 times like I have, you know what Tidmouth Sheds is – it’s where Thomas and his friends sleep and wait for their marching orders! Discovering that an actual Tidmouth Sheds exists was so exciting because it was yet another way to add excitement to the existing train track. And now when it’s bedtime, you can actually tell your son that Thomas needs to go to sleep too. Before my son loved Thomas, he loved shoes. Now that they’ve taken a back seat to all-things-train, I was ecstatic when I discovered hand-made Thomas the Train shoes on Etsy ! First of all, having one-of-a-kind shoes for your kid is the best. I can’t tell you how many compliments I’ve gotten from my son’s adorable Etsy-style shoes. And the Thomas shoes available on Etsy are no exception. They’re adorable! And if you’re not into the crafty one-of-a-kind look, have no fear. There are also adorable Thomas the Train sneakers you can get right off of Amazon. The Thomas the Train flashlight is a great way to get your toddler away from the TV and out of the playroom, while STILL taking advantage of his love for all-things-Thomas. When my son got his flashlight, he was so excited, he brought it with him everywhere! He’s had toddler flashlights in the past, but this one is an actual real flashlight, which makes it way more exciting for him. This is one of his favorites! This is an exciting one for both YOU and your son. A whole set of not-quite-Thomas trains will cost you a fraction of the price of the real thing, but still be just as exciting for your little guy. Thomas and his friends have to pull something, right? These are also great ones to take on-the-go or leave in your purse. An added bonus is that the box they come in can be used to store them! There’s regular Thomas, battery-operated Thomas, stuffed Thomas, and Take ‘N Play Thomas. So it was only a matter of time before the introduction of….mini Thomas! 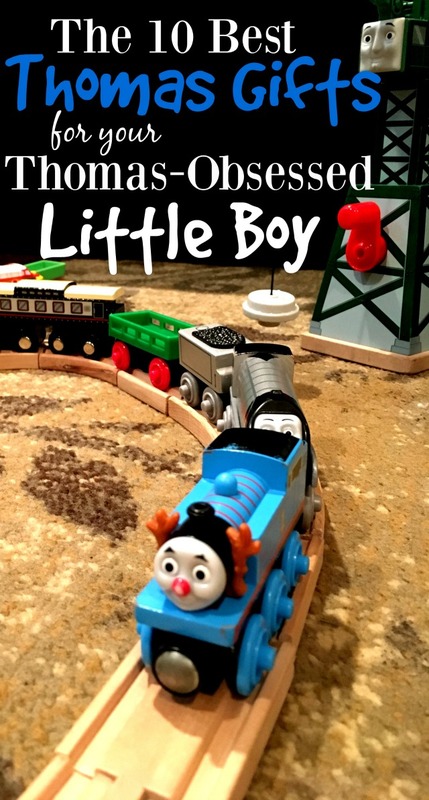 Thomas the Train minis are my son’s newest Thomas obsession and I must be honest, they’re a nice change from Brio because they’re way, way smaller and can easily occupy my son in the corner of a room (or restaurant, friend’s house, dressing room, etc.). This also means they’re cheaper and great for stocking stuffers, Easter baskets, or little extras. We’ve even used them as potty-training rewards! When we started accumulating minis, I purchased a Thomas Mini Carrier that ended up being one of the greatest purchases. Not only does it hold them, but the bottom of it doubles as a mini track for your trains! If you’re child loves their Minis, then they will really love the Thomas Mini Launcher! You can’t send a Brio train flying through the air (they’re wood…ouch! ), but apparently now you can send your minis flying through the air. Even the calmest train enthusiast wants to see their train fly through the air! 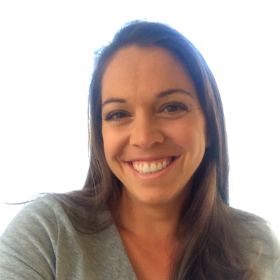 This a huge win…and really inexpensive, which is another great bonus. If your little guy hasn’t yet potty trained, then THIS is the gift to get! My son refused to sit on his other potty (which was still a special little potty for him…but apparently not special enough). 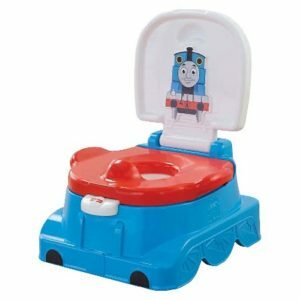 But once we got the Thomas Potty, everything changed. All of a sudden he was more than happy to sit on his potty and the first major step of potty training was done! The other cool thing about this potty is that it has multiple uses, so you can actually put the seat on an adult toilet and even use the bottom as a stool. There are a small handful of non-train Thomas friends and Cranky the Crane is definitely the most popular. What’s fun about Cranky is he adds an element of Sodor to your train set without having to be another vehicle. Cranky can also lift the trains and has two cranks that are a lot of fun for your little guy to twist around. Every little boy needs a pair of rain boots, so it should come as no surprise that Thomas the Train rain boots are a huge hit. And they are so unbelievably adorable. Guess. What. There’s a stuffed version of Thomas. I know this shouldn’t be shocking, since there’s a stuffed version of everything. But I couldn’t believe my eyes when my son was given his stuffed Thomas…and either could he. He is now a regular in my son’s bed and often his TV-watching buddy. I don’t think either of us knew what we were getting ourselves into the day we brought home battery-operated Percy. First, the battery-operated Thomas & Friends are bigger than the standard trains, which makes them extra special. But of course, the truly special part is obvious – they’re battery-operated and thus move on their own! My son LOVES his battery-operated trains. And while they don’t have the magnetic connectors to join the whole train line, they do still fit on the track, so they can scoot around on their own. Oh boy. The Thomas the Train robe is probably one of the cutest things I’ve ever witnessed. I only wish they had one in my husband’s size so I could make them match. My son LOVES this Thomas the Train gift. It’s comfy, all-out-Thomas, and he gets to dress just like Dad. This one is a no brainer, but it has to make the list because it’s sooo nice to pull them away from the TV! And of course, there’s a whole collection of Thomas books, so you’ve got quite a selection to pick from. My son’s favorite set are 3 little board books that came in a cute red Thomas box. But like I said, there’s a ton out there, so browse through Amazon and find the perfect fit for your little guy. There’s no question that Thomas is the big wig on the island of Sodor, but that doesn’t mean your little guy won’t be just as excited when you give him one of Thomas’ best buddies. And despite the fact that you may have gone a while thinking ALL trains were named Thomas, your son has most definitely known from Day 1 that Thomas is different from Percy who is different from James who is different from Toby and so on and so forth. So branch out! If there’s one thing that my son has taught me, it’s that you can’t possibly have too many train cars on your train line. Percy, James, and Toby are some of Thomas’ most popular friends, but if you’re looking for others, check out Spencer, Emily, Hiro, Ryan, Stephen, and Connor (I didn’t list them all, so if you’re still in need you can definitely find more options!). 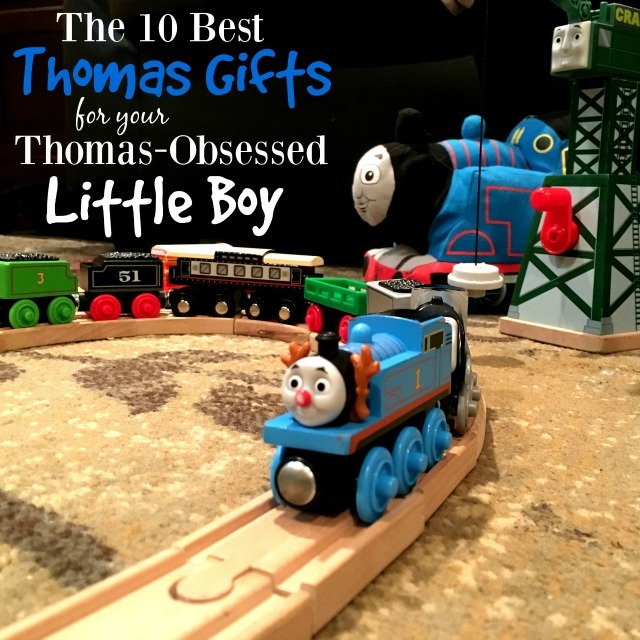 I hope this list of Thomas the Train gifts was helpful! Enjoy your Thomas-filled years. 🙂 They’re a lot of fun.